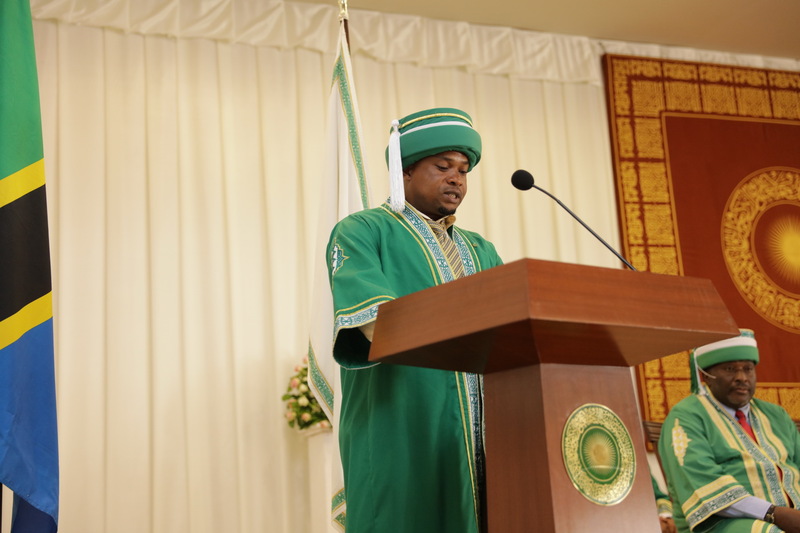 Abdallah Shaaban Hoza speaking at AKU’s convocation ceremony in Dar es Salaam, Tanzania. Valedictory speech presented by Abdallah Shaaban Hoza, AKU-IED, EA student. It is with immense joy that I represent colleagues in the masters in education Class of 2018 and the BSCN Class of 2018. I am privileged to stand at the lectern today to mark the completion of our respective programmes at the Aga Khan University and to recognise those who have made today such a great celebration. We have much to be thankful for today, for we had a great experience at AKU. It was an educational experience that was embedded with timeless values that moved us out of our comfort zones into a culture of inquiry that developed our skills and attitudes. This experience was made possible by our distinguished professors alongside a very caring and supportive administrative staff. Our dear faculty and staff, rest assured that we are very well packaged and prepared to surge forward and overcome whatever challenges we will have to face in our professional lives. Our time at AKU was well spent and we now have the much needed theoretical understanding of issues to enable us to make viable practical decisions offering the solutions required in our line of work, be it in the health or education sector. Our Guest of honour, we met here at AKU having left our beloved families behind in the pursuit for further education. It was not an easy decision parting with loved ones and especially our children, but we were determined to study and make this very special day real for each one of us. We are therefore grateful to our Chancellor His Highness the Aga Khan for the establishment of a University offering high quality education, scholarships and equal opportunities for women to access to tertiary education. We are grateful for the support we received enabling us to complete our programmes smoothly. Fellow graduates, I know that we all realise what a great gift is to be as prepared as we are. We consider ourselves privileged to have been beneficiaries of the unique educational experience we had here. I want you to remember the competitive knowledge, skills and attitudes we were furnished with. We have got the most prestigious academic excellence, and if you intend to pursue further education or not, you will still benefit greatly from what you learned at AKU. Many of us work in the public sector, mainly in the health and education sectors and we are grateful to our employers for release from duty. As you are aware, adult learners have many roles and responsibilities and so to be able to study as a full time or as a part time student is a great demonstration of the governments’ investment in our professional development. We appreciate all the three East African governments for the support given. To our families, many of whom are seated here today, you are very special. Thank you parents and also husbands and wives who for a long time were both ‘mama’ and ‘baba’ as we burned the midnight oil studying. We appreciate your commitment. More thanks to our brothers and sisters who stepped in to support our families while we immersed ourselves in the rigor of learning. We thank God also for protecting our families. Finally, fellow graduates and friends, this journey is over and we celebrate this milestone in our lives with joy and pride. But remember that, this is the beginning of another journey. We have been equipped so we have a responsibility to put into practice all that we have been taught in our places of work. Be the person that makes the difference in your office, be the person that people come for professional guidance. Be generous with your knowledge and skills. Let us be known for not only our competence but also our excellence. I urge us to be committed, responsible and diligent. As AKU’s Alumni, let us give back to the institution, which has given us so much, which will change our lives and of those around us forever. Thank you. God bless you and let us celebrate our achievement this day.